You can read the stories of how our pups, past and present, came into our lives below. They are all quite special to us and are definitely a part of the family. Our current dogs are Lois Lane, L.B., and Eclaire. They have all led interesting lives and each of their stories can be read below. They are our spoiled furkids, our entertainment, and forever our best friends. For more photos of my pups, take a look at the Dog’s Flickr set. You can also follow their antics on their own Instagram account at @allourpaws. Claire joined our gang on March 22, 2017. 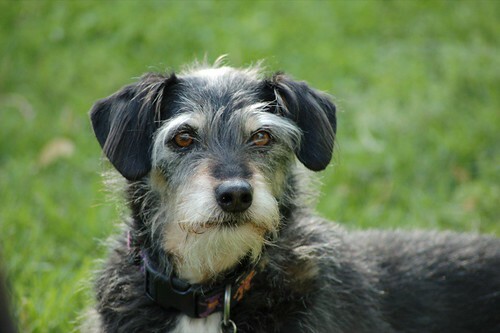 Claire was adopted from Louisville Metro Animal Services. She is a sweet, dainty little thing at just 10 pounds, but don’t let that fool you, she’s a handful! 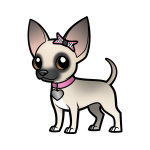 She is a chihuahua / pug mix. We went to the shelter in hopes of finding L.B. a playmate since Lois Lane and Buddy are in their senior years and really don’t have much interest in playing. When we first found Claire she had no name at all, just a number…how sad is that? She ended up at the shelter because she was in a car that had been repossessed and no one realized at the time that she was in there. 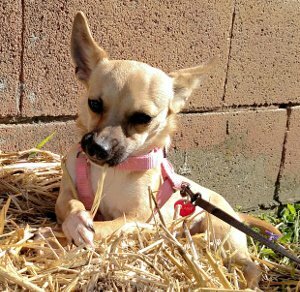 Her former owners were contacted once they realized what happened, but they apparently had no interest or means in coming to pick her up. So we are now the lucky ones who get to love her! We waited around the busy shelter for two hours before we got to meet Claire. She was very shy and a bit fearful of Jason (and men in general) in her cage, but once she was out of the cage and on my lap for about ten minutes she started warming up to him. She was all kisses, nibbles, and kept laying on her back in my lap. She knew how to win my heart! So we filled out the paperwork and brought her home that night. It took Claire about two weeks to settle in and start playing with L.B., and now she is just nuts! I think the shelter missed the mark on her age and she was more like 6 months than a year, so essentially we adopted a puppy. She keeps us on our toes for sure! She loves to steal socks, play fetch, and run zoomies in the house and in the yard. Most of all she loves people and thinks she belongs wherever we are…and so where we are, you will find Claire. 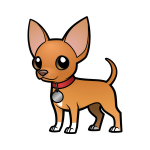 L.B., short for Little Bit, joined the household on February 21, 2013 when he was roughly three years old. 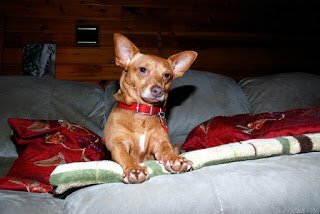 He is a red chihuahua / dachshund mix – aka Chiweenie. He was a two-time owner surrender at our local shelter thus high on the kill list, to no fault of his own. His first owner was forced to give him up for valid health reasons. The second owner only had him one day before returning him because he wouldn’t eat or go to the bathroom. L.B. must have just been nervous because he was fine from the moment he got to our house. He eagerly ate a bowl of food and proceeded to poo on the floor after. He quickly made friends with Lois Lane and Giant Dawg and fits right in. He did force us to make some fence repairs after he escaped through a gap and made me chase him a quarter of a mile, catching him just before he got to the main highway. I about had a heart attack that day! He has now been neutered and updated on all his shots and got a shiny new micro-chip. It’s also great fun watching a 10 pound dog play with a 100 pound dog! Lois Lane was a planned adoption about three months after we lost Rudy. When we choose to adopt a dog we always go through rescue societies (unless the dog finds us first, as in the case of Hardy and Blue). We found Lois through the Shamrock Foundation, a non-profit organization whose mission is to end pet overpopulation, reduce the number of companion animals destroyed in local shelters, and to save or enhance the lives of animals in need in our community. They accomplish this by relying on foster homes for the dogs and cats they bring in, as they do not have a physical shelter to work out of. 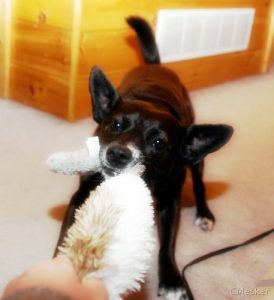 Lois Lane was about 2 years old when she wandered onto a farm in the summer of 2006 and had a litter of puppies. She was then turned over to the Shamrock Foundation where she was fostered for several months. The foster home she was staying in wasn’t working out very well, as two of the resident dogs there did not care for Lois and they had to be kept separated. When we decided to bring her home for a week trial basis to see how she got along with Blue and Hardy we learned that if our home did not work out for Lois Lane that the foster home was going to have to give her up. Sometimes when that happens the foster dog ends up back in the shelter due to lack of foster homes for them to be turned over to. Luckily, Lois was a perfect match for us and our dogs. Lois Lane has a crazy personality and is probably the most intelligent dog I’ve ever had. She has special games that she plays with each member of the family and she plays these games on a daily basis. For instance, when I walk in the door from work she greets me and then runs as fast as she can to jump in my office chair. There she will sit until I come over, ask her to shake and tell her to get out of my chair. Even if I go upstairs to change first, she’ll sit in that chair until I come down and chase her out of it. 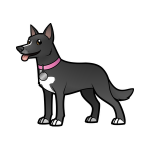 Lois also loves food, loves to run in the backyard, loves to watch (and chase) squirrels and adores her humans. On June 30, 2009 there were 37 dogs removed from a mobile home in Mt. Vernon, Kentucky. Every dog was severely emaciated and covered in fleas. There were dogs from chihuahuas to great danes, young and old. They were living in filthy conditions where they were standing in up to 6″ of feces in some areas. They were rescued by the United Rescues of Kentuckygroup and those that were healthy enough went to foster homes until forever homes could be found. 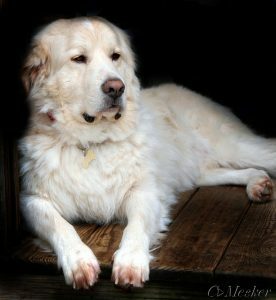 A friend of ours does Great Pyrenees fostering and posted a message on Facebook asking if anyone could temporarily foster a male Great Pyrenees mix. It was Fourth of July weekend and we had no plans so we offered our home up to him until he could be transported to the Great Pyrenees Rescue in Indianapolis the following week. We had been thinking about adding a fourth dog to our family and thought it would be a good way to see how we would handle four dogs. Needless to say, we fell in love with Buddy (named by Jason because he just looked like a big buddy) and decided to adopt him ourselves. He was 59 pounds when he came to us where he should be around the 100+ pound range. He was also unaltered and his coat was in pretty bad shape. He now weighs around 100 pounds, has been neutered and is coat is gorgeous. Buddy is a big ol’ love bug. He thinks he’s a 15 pound lap dog, he’s a leaner and loves to be brushed and get baths (thank goodness). He lives to bark at anything that moves and is only obedient at dinner time. I think Buddy is happy in his new forever home. We had to say goodbye to our Gentle Giant Dawg after having him in our lives for 9 years. We miss his sweet disposition, his demands to be fed and petted, and his comical play with the small dogs. Blue came to live with us in February of 2002. Jason had taken Hardy and Rudy (our belated lab/chow mix) to the vet for their annual check-ups. While he was there he saw a strange looking dog resembling a dingo in the office. When he inquired about the dog, the vet-tech had quite the story for him. She lived in a small, back country town (they are plentiful around here) and stopped to refuel on her way to work. As she pulled up to the pump she noticed the dog tied to the gas pump. When she went in to pay for her gas she asked the gas station attendant why there was a dog tied to the gas pump on a cold February day. He said someone had come by earlier that morning and tied him up and left him there. He went on to tell her that if the dog was still tied to the pump by the end of the day, he would be taking him out in the field and shooting him. With that news, the vet tech untied the poor dog, put him in her car and took him to work to have him looked over. He stayed there for a few days as they tried to find him a new home. That was when Jason happened to be a the vet’s office and happened to let Hardy and Rudy play with him and just happened to bring him home. Several years ago Blue ruptured a disc in his back and was paralyzed from the middle of his back down to the tip of his tail. We were devastated to learn that he would require immediate surgery and only had a 50/50 chance of regaining feeling and movement. Due to the fact that he was only about four years old at the time, we decided to take the chance and see if the surgery would work. He was in the doggie hospital for three days and we visited him every night after work. On the third day, he walked by himself out of the back room to go home with us. Blue was on cage rest for the next six weeks, which meant no running, no jumping and no steps. 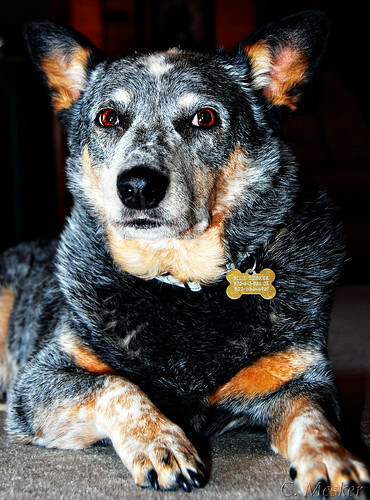 These restrictions are total torment to a heeler, but he did very well, for the most part. His favorite activities include eating, herding the lawn mower, vacuum cleaner and kids, and he highly enjoys tormenting the other dogs. He also must be under foot at all times and we trip over him at least ten times a day. Blue left us at 11 years old when we was diagnosed with spleen cancer that had spread to his liver. He will be very much missed and it will be odd not tripping over him several times a day. He is buried in the yard next to Hardy. Hardy came to live with us on Christmas Eve of 1995. Jason and I were on our way to visit Mama & Papa in Campbellsville, Kentucky with Portia sound asleep in the back seat. About five miles from our destination we noticed a black dog lying motionless in the emergency lane with a dusting of snow on top of him. As we passed by and both noticed him, we let out simultaneous sad “aww’s”, both thinking what a shame it was for a little dog to be dead on the side of the road, on Christmas Eve no less. Right at that time, his little head popped up and we immediately turned the car around to go get him. The poor guy was in really bad shape. He couldn’t stand or walk, he was skin and bones and he stunk to high heaven. On top of that he had a large gash in the top of his head and what appeared to be several cigarette burns on his face and head. Once we got him home we gave him a much needed bath, which turned the water so black we couldn’t even see through it. We gave him some water and food and a nice comfy beanbag to lay on. His stomach was so empty that he hurled up the water and what little was on his stomach within minutes of drinking. After that there were other projectile bodily fluids, much hobbling around and another bath. It was an eventful evening. Our intention was to keep him through the holidays until the shelter’s opened back up and then let them handle him from there. We were in an apartment at the time and really couldn’t afford the extra dog deposit and increase in payments per month. However, by the time three days had passed and the shelters were open again we ended up taking him to the vet to get a check over and some medication instead of turning him over to the pound. We had grown attached to him in that short time and didn’t want to give him up. The vet sent him home with antibiotics, an anti-inflammatory and some muscle relaxers and within days he was up and walking around on his own. Portia got the honor of naming him (she was almost three), but where she came up with the name Hardy we’ll never know, but it fits him well. At 17 years old, we had to let Hardy go. Not due to his age, oddly enough, but due to a brain tumor that had been developing for some time. He was deaf by that time and couldn’t see very well, but up until the last couple of weeks, you would never have known. He was a very difficult pup to say goodbye to, especially since he was our first dog together and he’d been with us for so long. But he’s with his Rudy again now and I will never forget that scruffy little face. We adopted Rudy from the Animal Care Society when he was 9 months old. He was born in the shelter and had lived his short 9 months there. Lucky for him, ACS is a no-kill shelter, else he would have been doomed as many black dogs are. We got Rudy so Hardy would have a playmate while we were at work every day. Therefore, we took Hardy with us to let him pick out his own dog. We put him in the rescue’s big play yard and let out our first choice. Hardy didn’t agree with us at all and we had to pass on Rufus. Next, we brought out Rufus’ playmate, Rudy. Hardy absolutely loved Rudy. If Hardy would sit, Rudy would sit. If Hardy would sniff around, Rudy would sniff around. Hardy adopted his own shadow, just in a much bigger form! 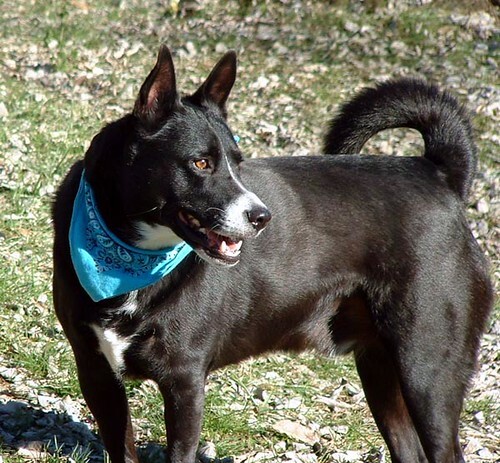 Rudy was a black lab/chow mix and one of the sweetest dogs I’ve ever had. He was a terror at first. He destroyed many rugs, ate door frame and destroyed two couches before we got him over his separation anxiety with some basic crate training. After that, he was a perfect angel. Sadly, when he was only 7 years old we found that two very large lumps had developed under his jawline. Thinking he may have been stung or bitten by something we took him to the vet where we found out that he had Stage 3 Canine Lymphoma. Within a week we had to let him go as he couldn’t even eat cheese. I miss my Rudy boy a lot, but I don’t regret one minute of having him in our lives.